Our Jackets are made from scratch in our workshop in Wolverhampton, UK. 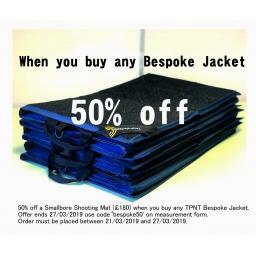 We make several jackets to suit shooters at a variety of levels and budgets. The Almond Bespoke starts at £850; Suitable for Prone and 3p. A hugely successful jacket with a nod to History. The Almond jacket is a result of working with Neil Almond whose mother, Brenda, was the chief tailor for Andrew Tucker. As a tribute to their hugely successful work we have created a jacket that we like to think would be worthy of their appreciation, with a few design features as tribute. Navy, Yellow and White. Here is some more information about the story behind the Almond Bespoke. 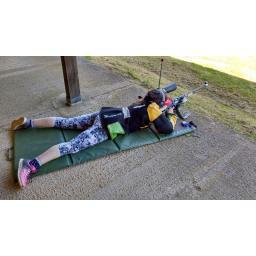 The Almond Lightweight starts at £330; Suitable for 3P, Prone and Standing. The styling and cut of the Bespoke jacket, in a successful off- the-peg format that works. Predominantly synthetic technical fabric outer, with heavy canvas in key panels, and leather trim and button stand, this jacket is the result of a distillation process of the key factors in the premium jackets, to create a starter jacket that works. Navy and Orange. The SF £595; Suitable for Prone. The prone-only counterpart to the League, the SF (Smallbore /Fullbore) is held in stock by the NSRA shop in the Lord Roberts Centre. Navy, Yellow and Grey. The Full Leather Bespoke starts at £950; Suitable for anything. This Jacket is exactly what you want it to be, it is often the best solution for those who struggle to go for Off-the-Peg generally and those with specific requirements. It can be in any colours you want. All jackets can have the added options of embroidery or leather applique letters. We also supply Kurt Thune and Hitex.